Note, you can also click the Quick Export Option. This will bypass the next step, where you choose your response options, and export your responses based on the system settings defaults. Export Mode: Choose between Standard CSV (can be opened in Excel), SPSS Compatible CSV, or SPSS Native Format. 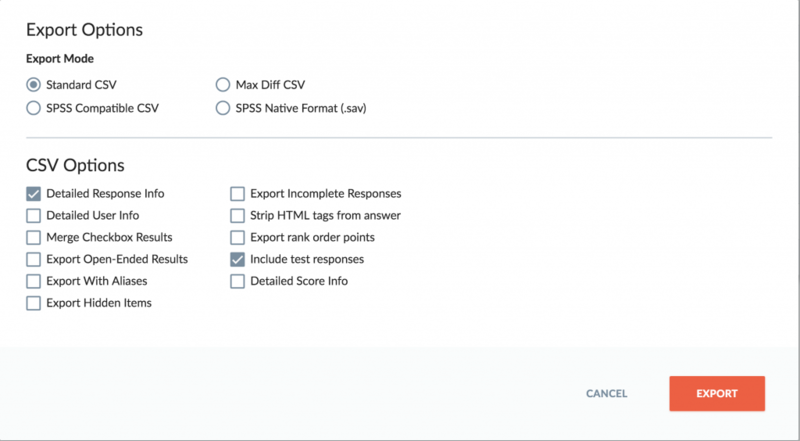 Max Diff CSV will be required only if you included a Max Diff question in your survey. Detailed Response Info: Includes information about the survey response, including the response ID, response GUID, start and end date/time, total time, last edit date/time, IP address, language, username, invitee. Detailed User Info: Includes contact profile properties associated with each response such as email address, first name, last name, etc. Merge Checkbox Results: Exports answers to each checkbox question in a single cell, separated by commas. If you leave this unchecked, answers to checkbox questions will be exported as one answer per column. Export Open-Ended Results: Includes open-ended text answers (multi and single-line) in the export. Export With Aliases: Exports any question or answer aliases that you created, rather than the standard question or answer text. Export Hidden Items: Exports the Hidden Items that are associated with each response. Export Incomplete Responses: Includes survey responses that were started but not completed/submitted in the export. Strip HTML tags from answers: Removes HTML formatting from open-ended responses for a cleaner look. Export rank order points: Exports point values, rather than item position, for any rank order questions in your survey. Include test responses: Includes responses marked as “test” in the export. Detailed Score Info: Includes score by page and possible score by page in your export, in addition to total survey score.